The key goals of Math Centers are to engage students in different math-related activities, build their problem-solving and collaboration skills, increase their desire to learn, and ultimately extend their understanding of math. Watch as elementary school students at Purple Sage Elementary School in Houston, Texas, choose a variety of center-based math games in small groups that help them better understand and practice mathematical thinking. The objective of this lesson is for students to review and practice grade-level- and skill-appropriate mathematical concepts and operations. 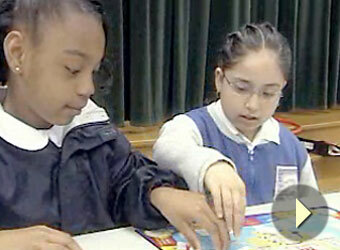 Third through fifth grade students choose from a variety of center-based math games that are played in small groups. Students interact, share ideas, and use critical thinking skills to construct alternative strategies for solving problems. As the instructor walks around and observes the students playing the math games, she uses questioning strategies to assess mathematical thinking and understanding, and provides students who need it with one-on-one tutoring opportunities. There is no set curriculum for center-based math games; however, it is important to offer a variety of games that will challenge students at a range of grades and ability levels. The games should also be connected to the concepts that students are learning during the school day so that they can get extra reinforcement for basic facts and extend their learning. Math centers are small-group stations that let students work together on fun math activities such as puzzles, problems using manipulatives, and brainteasers. Math centers give students opportunities to problem solve through a variety of activities, pace themselves, and work independently or with their peers. Talk to the school-day teacher to find out what math concepts students are learning, the standards for each grade level, and the kinds of activities that extend students' learning. For example, an activity involving money could help build students' understanding of numbers/operations. Activities should also be connected to student interest. Math centers work best when students have some choice in their activity, when they can approach an activity or problem from different angles, and when they work independently or with their peers to solve a problem. Instructors act as facilitators by circulating among the math centers, asking questions that guide students toward a solution, and providing feedback that encourages students' understanding of the mathematical concepts. Research suggests that math centers encourage students' independence and increases enthusiasm for learning by giving students opportunities to make choices, work together, and talk about math. When students work in small groups, they are more likely to explore different approaches to problem solving, and to question, take risks, explain things to each other, and have their ideas challenged. In this way, centers help bring math content to life through fun activities. When ELLs work cooperatively in math centers, they benefit from both watching other students and practicing their math and language skills in a safe, non-threatening environment. Because of the cooperative, problem-solving nature of math centers, ELLs are more likely to be engaged and enthusiastic about math than with textbook problems, which often pose the greatest language challenges for ELLs. Try to create natural situations in which ELLs need to communicate and practice their English with others. Encourage students to ask each other questions, such as, "How did you do that?" Math centers can provide a place for student-centered learning in which ELLs have the opportunity to practice their English in a non-threatening environment. Students use a variety of measurement skills, tools, and strategies to find the area of their handprints and footprints. Use the materials provided to trace your hand and foot separately. Make a prediction of whether your hand or your foot takes up more space. Find out if your prediction is correct. Prepare directions and materials to create inviting centers. Print out Measurement and Geometry: Hands and Feet (PDF). Some students will understand length, width, and area more quickly than others and may not need guidance on the use of a ruler or protractor. Be sure that students maintain the proper units of measurement as they proceed (centimeters, inches) and that all measurements for one object are taken using the same units. Students who are measuring will also need to use the formula for calculating area, or the space an object takes up (area = length x width). Allow students to come up with the formula on their own or have a conversation about what they might do with their measurements before you provide it for them. Students who are just learning these concepts may use nonstandard units of measurement, like counting the squares on the graph paper or simply guessing by comparing the size of their hands and feet. These students will need to estimate some squares in portions (halves, quarters) and will also need to keep track in some way of what has been counted. Coloring or marking counted spaces in some way will be helpful. However students decide to tackle the problem, allow them to explore on their own before stepping in to offer a suggestion. As students work together, the role of the instructor is to facilitate learning by asking questions that encourage students to use what they know about math to solve the problem as opposed to simply giving them the answers. Use the sample guiding questions below or develop your own. I notice that you are counting spaces, represented by boxes on your graph paper, inside your handprints and footprints. Why might this be useful in finding out which takes up more space? What method do you plan on using to solve the problem? What is your strategy? Can you restate what this question is asking you to do in your own words? How are you keeping track of your calculations? What did you learn from the others at the center that helped you solve the problem? Use the Measurement and Geometry: Hands and Feet (PDF) to review length, width, and area with students. Ask students to trace one hand and one foot on graph paper, then predict which is bigger. Students may count the squares on the graph paper as a strategy for making predictions. Next, ask students to measure the length and width of their handprints and footprints. When students have measured length and width, ask them to calculate the area of each one to test their predictions. Circulate and pose questions as students are working. Encourage students to work together to problem solve. Finally, ask students to report in on which was bigger, how they came to their answers, if their predictions were correct, and what they learned. Keep in mind that some ELLs might be more familiar with centimeters than inches. Allow them to use either. Reword the question "Which space do you think takes up the most room, your footprint or your hand print?" to "Which drawing takes up the most space, your footprint or your handprint?" Use gestures to help ELLs better understand the question being asked. ELLs may be able to demonstrate the concept of area better than they can explain it. Write and model the sentence structures below. Point to the words of the sample sentences so ELLs can follow and share their own sentences using the models. My foot (or hand) is ________ inches/centimeters long. My foot (or hand) is ________ inches/centimeters wide. My footprint (or handprint) is ________ inches/centimeters. Students explore and build pentominoes, figures that are made up of five squares and can be arranged to form different geometrical shapes. Small blocks or tiles work well for this activity, but if you don't have them, students can draw pentominoes on graph paper. Use the materials you have to create inviting areas (centers) where students have access to all the materials they may need. Print out the Geometry: Finding Pentominoes (PDF) and review the possible shapes students can make with up to five squares. The bottom row will show you the 12 possible shapes students can make with pentominoes. Begin with something students already know. Show them a domino and ask them how many squares are in a domino. Next, add a square to the domino to make a triomino, a three-square shape. Ask students what the domino and triomino have in common. They should be able to see that in each shape, the squares are connected on at least one side. Ask students to use their squares to see how many different shapes they can make with the triomino. Remember that at least one side of a square must line up with the side of another square. As students are working in centers to find all 12 pentominoes, use these guiding questions to assess students' progress and encourage them to think for themselves. Can you tell me how you know that this shape is a pentomino? How do you know that each pentomino you have created is different? How can you figure out if one of your pentominoes is the same as another? Create groups of four to five students for each center. You may want to assign students to groups based on their needs and abilities, or ask them to count off for random groups. Using the pentomino you created, turn it so that it is still the same arrangement of squares, but facing in a different direction. Explain that this is not a different pentomino because the combination of squares is the same. Explain that there are 12 possible pentominoes, or 12 possible shapes that can be created by combining five squares. You have already created one pentomino. Working in groups, students' task is to find the other eleven. Now, ask students to work together in groups, taking turns, to find as many different pentominoes as they can. As they create a pentomino, they should draw it on graph paper. Circulate among the centers to make sure all students are participating. Ask questions, and provide positive feedback to encourage learning. As each group finishes, check in to see if they found the other 11 pentominoes. Discuss the activity with the whole group. Which pentominoes were the easiest to find? Which were the hardest? What did you learn? Group ELLs with strong English speakers so that English speakers can model instructions and ELLs can practice basic interpersonal communication skills. As noted in the text of the example lesson, be sure to demonstrate to ELLs how turns and flips do not constitute a new shape. Students need to understand the meaning of the words turn and flip as they relate to geometry. Use blocks to physically demonstrate each of the words. Then ask ELLs to perform a similar action with a different shape. A student who can perform a turn or flip following a verbal command has demonstrated his or her understanding of the word or concept. Consider extending this activity by helping students recognize commonly used prefixes such as those used in the words domino, triomino, quadramino and pentamino. They can begin to infer the meaning of other words consisting of these same prefixes. Use pictures and word cards consisting of root words and these prefixes. Ask students to label various pictures on the board or word wall. For instance, ask students to find the word and label the picture which describes a five-sided shape (pentagon). Other words to play with include tri + angle (three angles), tri + pod (three footed), tri + cycle (three wheeled), quadru + ped (four feet or footed), quadri + lateral (foursided), pent + angle or pentacle (five-pointed star), and penta + dactyl (five digits or fingered or toed). Students use number and operation skills to figure out how best to spend a gift certificate at their favorite restaurant. Gather materials and arrange centers, giving students access to materials. Print out copies of Number and Operations: Using Gift Certificates (PDF). Base-10 blocks are wooden or plastic blocks that represent units of 1, 10, or 100. In this lesson, students can use them as they would play money to represent quantities as they figure out how to spend their gift certificate. Base-10 blocks are an example of a manipulative, a concrete object that helps some students calculate amounts. Guiding questions offer problem-solving prompts that encourage students to think for themselves and use what they know to figure out the answer. For example, students may present an answer and ask you if it is right. Instead of simply saying yes or no, you might want to ask them how they got their answer, if it makes sense to them, and if they know how to check their math to see if their answer is right. In this way, students are using what they know to answer their own question, and learning how to justify their thinking. What do you know about the problem? For example, how much can you spend? How many people are using the gift certificate? What does that tell you about how much each person can spend? What method do you plan on using to solve the problem? What is your strategy? How are you keeping track of your thinking and which strategies you have tried? What materials could help you solve the problem? How did you find your answer? Does it make sense? Did you answer the question? Go back and check. What did you learn from other students that helped you solve the problem? Finally, how can you show that your answer is correct? Create groups of four to five students for each center. You may want to assign students to groups based on their needs and abilities, or ask students to count off for random groups. Students may work independently with group support, or together as a group. For group work, you may want to ask each group to delegate one student to read the mission description and guiding questions, and other students to be in charge of different materials and tasks to ensure that everyone participates. Explain to students that they will have 30 minutes to complete the activity. Circulate among the centers, listening to students' conversations and facilitating discussion by asking questions that guide students toward a solution. Be ready to model problem solving with base-10 blocks or other materials. Provide positive feedback to encourage students' success. When students have completed the activity, ask each group to present their solutions (there may be more than one), as well as the steps and mathematical reasoning involved. Allow time for questions and answers. ELLs may not be familiar with American currency, so having play money available for them can help increase their understanding and participation in this activity. This lesson could be modified so that ELLs each receive $15 in various bills and coins and are responsible for making change and paying for their own food choices. Use a picture dictionary or play food items to help ELLs with their menu selections. Have ELLs count their payment out loud, adding as they go. For instance, to purchase spaghetti and a salad, a student would select a ten-dollar bill, three quarters, two dimes, and four pennies and count out loud: Ten dollars, ten dollars twenty-five cents, ten dollars fifty cents, ten dollars seventy-five cents, ten dollars eighty-five cents, ten dollars ninety-five cents. Have students practice reading dollar and cent amounts using the word "and" in place of the decimal point, such as "ten dollars and ninety-nine cents for $10.99." If time allows, have pairs of ELLs role-play being the customer and the server. Write on the board or chart paper a brief dialogue that they can use. Server: Hello. May I take your order? Customer:	Yes. May I have spaghetti and a salad, please? Server:	Would you like anything to drink? Customer:	May I have a lemonade? Students collect data using large and small marshmallows, much like flipping a coin, to determine the chances of a marshmallow landing on its end or side. Prepare a plastic bag with several large and small marshmallows for each pair of students. Print and copy the Data and Probability: Marshmallow Madness (PDF) recording chart. Create an inviting area for students with access to all of the space and tools they need. Each time students flip a marshmallow and record the result, they are gathering data, information that will help them determine the likelihood of that result happening again. Once students have flipped marshmallows and recorded their answers, they are ready to write their answers as fractions and say what fraction of the time a given marshmallow will land on its side or end. For example, one of the follow-up questions asks: What fraction of the time will a small marshmallow land on its side, according to your experiment? Sample Answer: If you flip a marshmallow 50 times and the marshmallow lands on its side 20 times, the answer is 20 out of 50 times. To write that as a fraction, you simply write 20/50. This can also be expressed as 2/5 (two-fifths) of the time. Ask students to pair up in groups of two. Review the definition of "data" as pieces of information that students gather to tell the likelihood of something happening. Review Molly's Marshmallow Problem with students and make sure they understand their task. Review the question by asking, What is this problem asking you to do? Ask students to make predictions about whether the two differently sized marshmallows are more likely to land on their sides or ends. Encourage students to find ways to work together. For example, one student might flip marshmallows while the other records results. As students work together in their centers, move from center to center and ask guiding questions that encourage students to explain their reasoning and work. Try to use new math vocabulary in your interactions. For example, talk about the data, the table for collecting data, and what the data tell (how to interpret the numbers they are recording). When students have finished collecting the data from the marshmallow flipping, review the follow-up questions in the problem and how to write fractions from the data (see Teaching Tips). Ask each pair to present findings, reporting in on initial predictions and whether the answers make sense. If time allows, consider converting fractions to percentages. Adapted from the Connected Mathematics Program. Pair ELLs with strong English speakers so that English speakers can demonstrate the task and the instructions. Demonstrate and draw on the chalkboard or chart paper what is meant by "end" and "side." Label each part of your illustration clearly so that ELLs will make the connection between the illustration and the words on Molly's Marshmallows (PDF) recording chart. Have beginning ELLs illustrate the respective columns and rows on the chart with pictures to represent "large," "small," "side," and "end." ELLs may have difficulty saying fraction names because the final -th sound used with fractions does not exist in many other languages. If time is available, make four columns on the board or chart paper with numbers and fractions paired with their corresponding words. Model reading the whole-number words while pointing to each word and moving down the column. Then, say the fraction words while pointing and moving down the column. Next, model and point as you move across each row (one, one-whole; two, one-half...). Students explore number patterns and basic geometry concepts through geometric art, they compare drawings, and discuss their findings. Print out the accompanying PDF and familiarize yourself with the task students will be involved with. If necessary, make time to share the lesson with a day-time mathematics instructor and to converse about the standards and mathematics involved. Organize students in small groups that will allow them appropriate discussion partners. The success of this lesson depends, in part, on each student's ability to feel free to explore and discuss his or her ideas within a math center. Prepare a brief introduction of the task students will be involved with. You might ask if any students have a particular interest in art. Some pictures of geometric art might be of interest and can serve as a useful bridge to the content (an Internet search on "geometric art" yields many examples). Clarifying the task and peaking students' interest in the problem are the goals of this discussion. Give a brief introduction of the task. Allow students time to read through the worksheet. Let students talk with each other about the task at hand, and ask any questions they have to their peers. Have students try the same numbers (2, 3, 4) but in a different order (e.g., 3, 2, 4). Have students try another simple three-number pattern, like 2, 4, 6. Ask what happens if they use all even numbers. This might give students a starting place, and help get them "unstuck." As you circulate, try to stay active in students' work. Don't get bogged down at one center for a long period of time. Make sure students try various number sequences. All even and all odd numbers might be interesting for some. Also, not all helix-a-graphs return to the starting point. Challenge students to figure out which number patterns generate graphs that never end. Students use algebraic skills and thinking to sort objects and recognize patterns, relationships, and functions. Use the materials you have to create inviting areas (centers) where students have access to all materials they may need. Have objects to sort mixed in a large bowl or bag at each center and place a handful on a plate for each student. Assign students to small groups of four or five for each center. Review the objects with students, and ask them how each one is similar or different (shape, color, size, use, texture). Ask students to sort the objects on their plate in any way they like. Observe the variety of ways in which students are sorting. Ask students to share their strategies with the other students at their centers. Then ask students to use graph paper or unlined paper and pencils or crayons to represent the amount of each type of item they have grouped. Have them compare their totals within their groups. See Algebra: Sorting, Representing, and Patterns (PDF). As students work together, circulate and ask guiding questions that encourage students to think for themselves. Next, have students play with patterns using the objects they have sorted. Ask all students to create the same pattern on their plate (for example, two candies, one button, two candies, one button). Then ask them to represent the pattern on their paper numerically (2, 1, 2, 1). Students should then have opportunity to explore other patterns on their own and within their groups. Although young ELLs may understand the concepts of similarities and differences, the afterschool instructor may need to demonstrate these words in English so that ELLs can follow and participate in the activities. For example, gather a group of common objects that could be sorted in various ways. Tell students that you are trying to find the best way to organize the objects. Ask for suggestions and for volunteers to demonstrate which items should go together. Remind students that there is no one right answer. Observe whether ELLs follow your instructions when they create a pattern of your choosing with the items from their plates. If they don't understand, model the pattern and repeat the pattern orally. Have ELLs continue the pattern that you have started. This activity provides a great opportunity to observe and informally assess whether ELLs can use numbers non-sequentially. During the activity, try to listen to ELLs individually to determine if they can represent the pattern numerically, both on paper and orally. Using a word wall, provide ELLs with an assortment of descriptive words from which to draw when sorting objects. If possible, illustrate these words with simple drawings or pictures to reinforce their meanings. Encourage ELLs to utilize these words when describing their criteria for sorting. Research has shown that visual learning techniques are used widely in schools across the country to accomplish curriculum goals and improve student performance. Math Centers are one way afterschool practitioners can utilize technology to continue these techniques in an afterschool setting. Visual thinking software packages such as Inspiration and Kidspiration allow students to express their mathematical learning using these visual techniques. The Kidspiration Web site provides a sample download of the program, as well as examples of how this software can be utilized in mathematical learning at varying grade levels. For programs or sites that do not have access to this software, bubbl.us Brainstorming Software offers similar functionality to Kidspiration in the form of a free online tool. Erickson, T., 1989. Get It Together: Math Problems for Groups. Lawrence Hall of Science, Berkeley, CA. Passe, J. (1996). When students choose content: A guide to increasing motivation, autonomy, and achievement. Thousand Oaks, CA: Corwin Press, Inc.
Sutton, J., & Krueger, A. (Eds.). (2002). EDThoughts: What we know about mathematics teaching and learning. Aurora, CO: Mid-continent Research for Education and Learning (McRel). Van de Walle, J. A. (1998). Elementary and middle school mathematics: Teaching developmentally (3rd ed.). New York: Longman Erickson, T., 1989. Get It Together: Math Problems for Groups. Lawrence Hall of Science, Berkeley, CA.